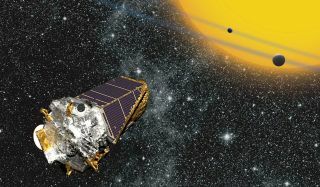 An artist's illustration of NASA's Kepler Space Telescope, which has found over 4,000 exoplanet candidates since its launch in March, 2009. NASA will unveil a potentially exciting discovery on Thursday (July 23) regarding the search for alien planets. In a teleconference at 12 p.m. EDT (1600 GMT) tomorrow, the space agency will announce new findings made by the planet-hunting Kepler Space Telescope. You can tune in to the announcement live via an online audio feed provided by NASA. A statement from NASA announcing the teleconference did not provide any additional details as to what new information will be unveiled. "Exoplanets, especially small Earth-size worlds, belonged within the realm of science fiction just 21 years ago," according to the NASA statement. "Today, and thousands of discoveries later, astronomers are on the cusp of finding something people have dreamed about for thousands of years -- another Earth." Participants in the teleconference will be John Grunsfeld, an associate administrator for NASA's Science Mission Directorate in Washington; Jon Jenkins, Kepler data analysis lead at NASA's Ames Research Center in Moffett Field, California; Jeff Coughlin, a Kepler research scientist at the SETI Institute in Mountain View, California; and Didier Queloz, a professor of astrophysics at the University of Cambridge, United Kingdom. The $600 million Kepler Space Telescope launched in 2009 with the goal of studying the diversity of planet systems in the Milky Way galaxy. In addition, the mission aimed to find rocky, Earth-like planets orbiting their parent stars at a distance where liquid water could form (the so-called "habitable zone," or "Goldilocks zone"). The telescope detects planets with the so-called "transit" method: When a planet passes in front of its parent star, partially blocking its light, Kepler observes the tiny dip in the star's brightness. Kepler has detected 4,661 planet candidates, of which 1,028 have been confirmed. In May 2013, Kepler ended the first phase of its mission when the second of four "reaction wheels" failed on the spacecraft. The reaction wheels are devices resembling a gyroscope that maintain Kepler's position in space.